Children's Stories - What a Sweet Surprise! "Our tour of Scotland is coming along wonderfully, Bruce. I’m learning so much and seeing the most amazing things; flowers, statues, mountains and animals. Where are we headed this time?" 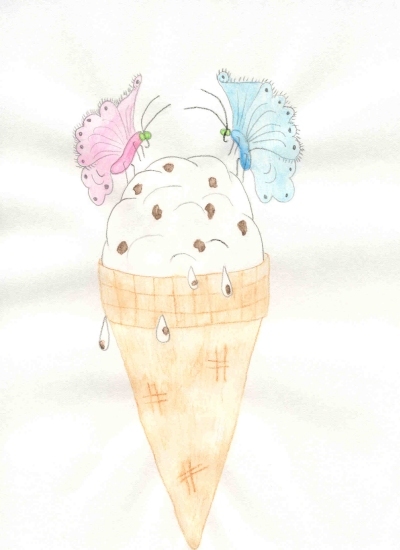 Bonnie, the butterfly asked as they flapped their wings and fluttered across an azure blue sky. "The east coast is very pretty, though the further north we get, the more rain we’re likely to run into. But, if you don’t mind that, we’ll head to this village called Brora. I’ve got a surprise for you there," Bruce teased. "A surprise? For me? What is it?" Bonnie asked. "Can’t tell you, but you’ll find out when we get there," Bruce answered. They looked down on the coastline as they flew north. "It is rugged," Bonnie said. As they neared Brora, she noticed fishing boats coming and going. "Is Brora a large fishing port?" "In the 1800’s it did quite well during the herring days, but now it’s just a small fishing village. Do you see over there?" Bruce pointed. "There used to be salt pans? In 1818, Brora provided salt for all the needs of the herring trade. They also used to have coalmines here too, but none of that remains either. Change comes and things progress." "I see a river! It’s beautiful," Bonnie noted, "but the town, is rather dismal looking. Even though the sky is blue, it looks drab." "They use gray stone in their buildings. Imagine it on a damp, drizzly, overcast day. Let’s head down to the center of town." The butterflies fluttered softly down, landing on a bench. "Here we are." "What’s the surprise then?" Bonnie asked. "Herring, salt, coal, or a piece of gray stone?" she giggled. "You’re very funny, but no to all. Come with me," he said, flying across the street. They landed in front of a building. "What’s this place?" Bonnie asked. "Why are we stopping here?" "Look in the window," Bruce urged. They flew up and peeked inside. "Well?" "It’s an ice cream store called Capaldi’s. It looks like they sell a lot of ice cream. Is this the surprise?" Bonnie asked. "It is ice cream. Isn’t it a sweet surprise? They make it here. It’s a special kind, from Italy. Brora is famous for it. Don’t you like ice cream? It tastes good on a warm day, like today," Bruce questioned. "It depends on the flavor. What kind is there?" she asked. "Let’s go in and find out." When a customer opened the door, the two butterflies flew inside. They set down on the rim of a large carton of strawberry ice cream. Bonnie stuck her proboscis into it. "Delicious," she said. "It’s cold, creamy and tasty." Bruce tasted some chocolate chip ice cream. "This is good too. Wow. There are a lot of flavors. I see one called Honeycombe, Rum and Raisin, Mint Chocolate Chip, Toffee and so many more. It’s hard to choose." Just then a man picked up a container. It was mostly empty but had just a little butterscotch chip ice cream left in the bottom. He couldn’t scoop enough out to make an ice cream cone or dishful. Bruce and Bonnie followed him. "Where’s he taking that?" Bonnie wondered. "It’s butterscotch chip. I love butterscotch chip. If he puts it in the rubbish, then we can eat as much as we want," Bruce replied. When the man opened the back door, they followed him out. Just as expected, he put the container in the rubbish bin and then went back inside. "Ah, butterscotch chip. It smells wonderful and sweet and," she took a taste, "it tastes as good as it looks and smells. Fantastic!" Bonnie said. She and Bruce licked the container until there wasn’t a drop left. "That was delicious," Bonnie said, rubbing her tummy, which seemed to be a little fatter than normal. "Ooops," she chuckled. "That was good! Now that we’ve feasted on ice cream, we’d better find us a nice flower to take a nap in," Bruce suggested. "I noticed some purple, grape hyacinth growing near the Brora River. Care to join me there?" he asked. Bonnie was so full, all she could do was nod. They fluttered away to the river and soon found the hyacinth. Bonnie fell asleep right away and Bruce soon followed. They’d not forget the delicious butterscotch chip ice cream! Check out the ice cream here!